258 pages | 45 B/W Illus. Since the early 1980s, researchers and practitioners in the organisational and management fields have presumed a link between organisational, or corporate, culture and organisational performance. Whilst many believe this exists, other authors have been critical of the validity of such studies. Part of this doubt stems from a reliance on measures of organisational performance that are based purely on financial measures of business growth. 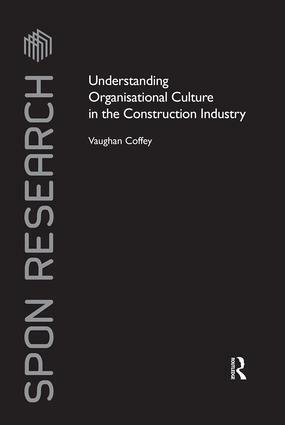 Using the construction industry as the subject of his research, Vaughan Coffey traces the development of the literature on organisational culture and business effectiveness and investigates the culture-performance link using a new and highly objective measure of company performance and an evaluation of organisational culture, which is largely behaviourally-based. Providing a theoretical contribution to the field, this work shows that various cultural traits appear to be closely linked to objectively measured organisational effectiveness. This book will be valuable to professionals and researchers in the fields of management and public policy. It indicates directions for construction companies to develop and change, and in doing so strengthen their chances of remaining strong when opportunities for work might deplete and only the most successful companies will be able to survive. Vaughan Coffey is Lecturer in Construction and Project Management in the School of Urban Development at Queensland University of Technology, Australia, and was formerly a senior manager in the Construction and Development Division of the Hong Kong Housing Department, with special interests in organisational culture, construction quality issues and performance monitoring.